NOTE: The Red Nation stands in solidarity with our Indigenous brothers and sisters, as well as the so-called ‘protesters’ of the ‪#‎COP21‬ United Nations Conference on Climate Change. We recognize a radical systemic change is necessary to adequately address global warming and hold corporate polluters responsible. We support the actions of the Indigenous Environmental Network (see statement below) and other NGOs inside the Paris Climate Talks who are speaking truth to power. We also support those whose only voice can be expressed through direct action in the streets of Paris. Under the current suspension of the French Constitution, environmental activists have faced increased repression and surveillance by French police suppressing any kind of alternative anti-capitalist vision or perspective to corporate-backed negotiations. Native people are under constant assault by a capitalist-colonial logic that seeks the erasure of non-capitalist ways of life. Colonial economies interrupt cooperation and association and force people instead into hierarchical relations with agents of colonial authority who function as a permanent occupying force on Native lands. These agents are in place to enforce and discipline Native peoples to ensure that we comply with capitalist-colonial logics. There are many methods and agents of enforcement and discipline. There are the police. There are corporations. There are also so-called ‘normal’ social and cultural practices like male-dominance, heterosexuality, and individualism that encourage us to conform to the common sense of capitalism-colonialism. These are all violent forms of social control and invasion that extract life from Natives and other oppressed peoples in order to increase profit margins and consolidate power in the hands of wealthy nation-states like the United States. The whole system depends on violence to facilitate the accumulation of wealth and power and to suppress other, non-capitalist ways of life that might challenge dominant modes of power. Political possibilities for Native liberation therefore cannot emerge from forms of economic or institutional development, even if these are Tribally controlled under the guise of ‘self-determination’ or ‘culture.’ They can only emerge from directly challenging the capitalist-colonial system of power through collective struggle and resistance. We demand the end to capitalism-colonialism on a global level. Native peoples, youth, poor and homeless, women, LGBTQ2 and nonhuman relatives experience extreme and regular forms of violence because the whole system relies on our death. Capitalism-colonialism means death for Native peoples. For Native peoples to live, capitalism and colonialism must die. 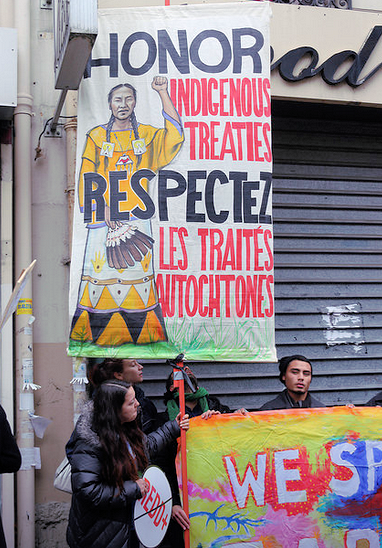 November 30, 2015 (Paris) – Indigenous Peoples from the Americas attending the United Nations World Climate Summit in Paris warn that the Paris climate accord will harm their rights, lands and environment and do nothing to address climate change. “We are here in Paris to tell the world that not only will the anticipated Paris Accord not address climate change, it will make it worst because it will promote false solutions and not keep fossil fuels from being extracted and burned. The Paris COP21 is not about reaching a legally binding agreement on cutting greenhouse gases. In fact, the Paris Accord may turn out to be a crime against humanity and Mother Earth,” according to Tom Goldtooth, Executive Director of Indigenous Environmental Network based in Minnesota on Turtle Island also known as the United States. Goldtooth recently won the Gandhi Peace Award. According to Crystal Lameman of the Beaver Lake Cree Nation, Alberta, Canada “After 21 years of these climate conferences, our First Nation wants to be hopeful this agreement truly stops a history of CO2lonialism and business-as-usual with expansion of fossil fuel exploitation on and near indigenous territories. We are here to protect, defend and renew our Mother Earth, not to rubber stamp an agreement that allows polluters to continue to burn the planet. False solutions such as carbon trading, carbon offsets, agrofuels and nuclear energy will probably be the basis of the Paris Accord and the so-called decarbonization of the global economy. False solutions to climate change instead of solving the climate crisis, are resulting in land grabs, human rights violations and will allow global warming to spiral out of control.” Lameman is featured in the film, “This Changes Everything” directed by Avi Lewis and based on the book by Naomi Klein. Indigenous leaders throughout the world are particularly concerned about REDD (Reducing Emissions from Deforestation and forest Degradation), a United Nations carbon offset mechanism that uses forests, agriculture and many other ecosystems as sponges for northern industrialized countries pollution instead of reducing emissions at source. According to Nnimmo Bassey, co-coordinator of the No REDD in Africa Network, “REDD may result in the largest land grab in history. It steals your future, lets polluters off the hook and is new form of colonialism. We demand that states and corporations stop privatizing nature!